I overheard this information at a great new restaurant in Yukon last weekend..."This location was originally built by LIBERACE as the 'Chateau' with the motel next door.." Not sure if you're a Liberace fan, but I found that little nugget of history interesting... I did not see a piano or lots of bling nearby so it's not confirmed yet! Who knew?? 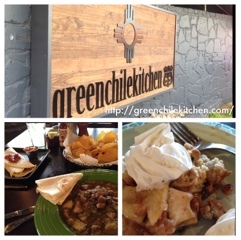 Fresh, spicy and very tasty is my summary.. From the Pasole to the Green Chile Stew and Green Chile Quesadilla and even my (2) free pieces of Green Chile Apple Pie..yum, yum and YUM!. (not sure if you noticed the theme here...GREEN CHILE). One of the owners has notoriety of some sort as I saw on KFOR news last weekend. Sounds like a recipe or two got noticed and was written up in a few publications. FROM THEIR SITE: "Green Chile Kitchen Route 66 was opened in 2012 by the Peters and Logan families. It is the sister restaurant of Green Chile Kitchen, in San Francisco, CA, which was opened in 2006"
Prices were reasonable, the staff accommodating, and it was busy. The young man that waited on us was informative, kind and helpful with our selections. We did wait for a table a little longer than I'd like but hey...it was the official grand opening and very busy (a good problem to have). So, let's have a little grace.. This place is right on old Rt66 and is well worth the stop! I looked up the UrbanSpoon reference and it was lower than expected but only because the location is somewhat new and most of the bad remarks revolve around things that are a "work in progress"
My wife and I totally recommend it and look forward to going back again very soon!